Michael Kors Selma Medium Satchel in a gorgeous Soft Pink with gold hardware. Condition is Pre-owned in excellent condition. Shipped with USPS Priority Mail. Includes all tags & care booklet. 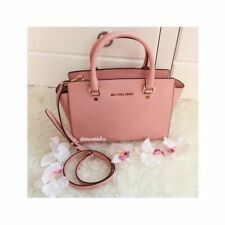 Michael Kors Selma Medium Satchel Soft Pink pre owned free beauty gifts. Condition is Pre-owned. Shipped with USPS Priority Mail. michael kors medium selma satch soft pink. Condition is New with tags. Shipped with USPS Priority Mail. Interior Details: Back Zip Pocket, Front Slit Pocket. 85% Leather/15% Lamb Leather. Color: Raspberry. Interior features back wall zip, 4 slip pockets and key fob. Longer removable adjustable strap with up to 19" drop. Top zip closure. Saffiano leather. Dust bag included.